The greatest cycling trip of my life. 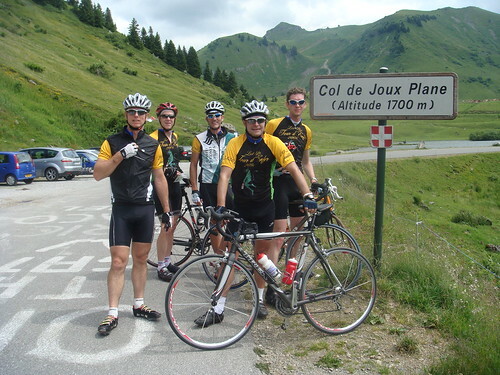 Ten great days cycling in the Alps with great company. 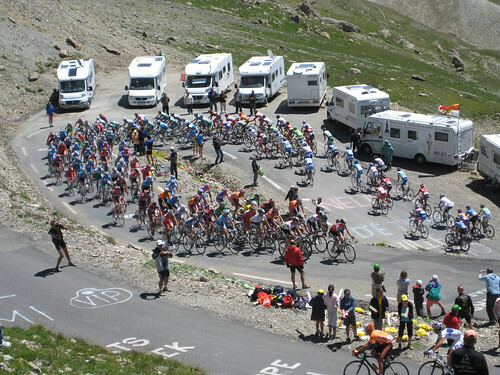 Major Cols: Col de Joux Plane, Col de la Colombiere, Col des Aravis, Col des Saisies, Cormet de Roselend, Col de l’Iseran, Col du Mont Cenis, Col du Lautaret, Col du Galibier, Col du Granon, Col de l’Echelle, Col de Vars, Col d’Izoard, Col de la Cayolle, Col de la Bonette, Sainte Anne de Condamine, Col d’Allos, Col de Pontis, and a few other minor Cols. Welcome to the Alps! Climbing Col de la Colombiere we ran into a huge thunderstorm. As we got higher, it briefly turned to hail. Yikes. There was really no other choice but to laugh and keep pedaling – as fast as possible. Everyone watched the Tour de France in different places. 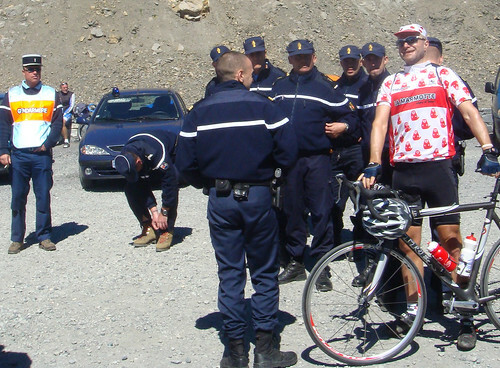 Ralph and I braved a gauntlet of French police to make it to the very top of Col du Galibier. 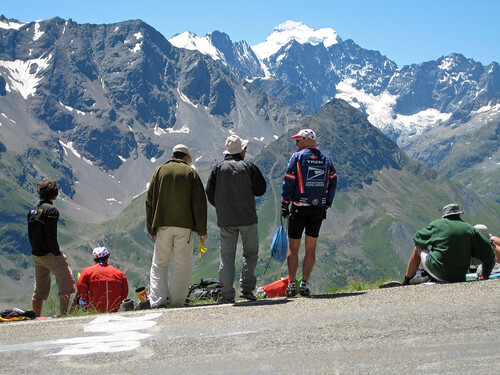 As usual the crowds, the publicity caravan, the amazing views/climb – and the race itself – led to a memorable experience. Every single ride was stunningly beautiful and unique in its own way. The joke got to be that there was no way tomorrow could be better, but it always seemed to be. There is nothing like cycling up high in the mountains. I spent most of the rides either breathing heavy or laughing. I rode with loads of different people and had a great time absolutely every ride. Yes, even during the hail. 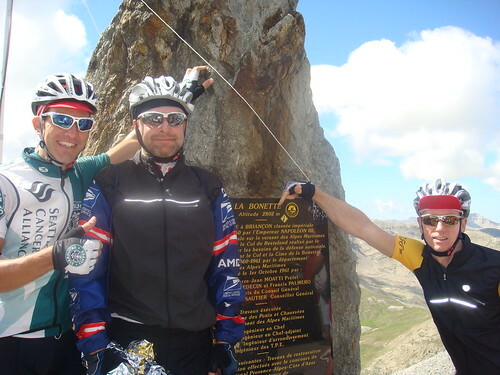 It’s hard to pick a favorite climb, but everyone seemed especially excited and motivated cycling up Bonette – labeled as the highest road in Europe. 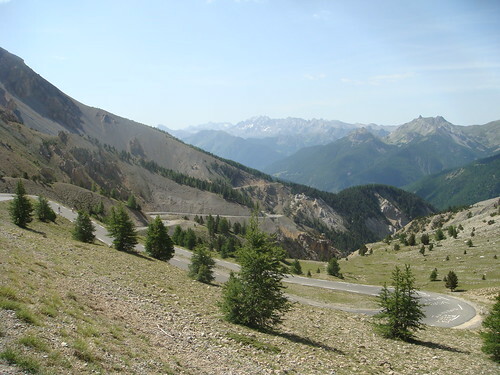 I was especially proud of Doreen, who had joined us in Barcelonnette, who persevered on her heavy touring bike to add this to her climb collection. The Map: All the Cols, and a very rough route for 1st 6 days then we were based in Barcelonnette. Looks like you have had a fantastic trip Will. It is so much fun doing this sort of thing in a big group. And as you say, there really is nothing like cycling up in the high mountains! Nice wrap up! This was the best adventure I have had in a long time! I still laugh out loud many times a day (people stop & stare, or get ready to call the police) as i think back over the scenery, cycling companions, the ascents, the food, …. and of course the anticipation of doing it again sometime soon. Great photos, and a great way of remembering a really fun trip. 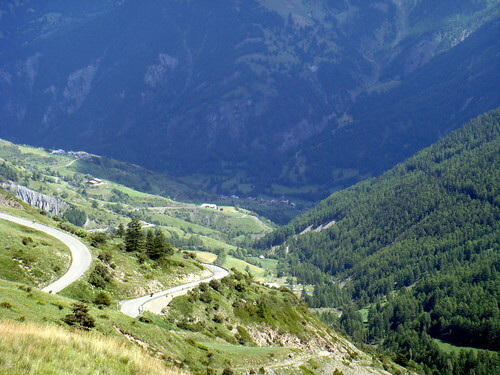 It was no surprise how quickly we all got into the daily rhythm of the Tour d’Enfer but it has come as a shock to return to the real world where I don’t get on my bike each morning and climb through the most spectacular scenery imaginable. On the positive side, I am getting a big breakfast again but on the negative side–well, I’m not there where each climb is better than the last one. +1 for Doreen on a racing bike. She CAN do it! Congrats on such an amazing trip. I really need to figure out a way to live in the Alps. Any ideas for good central location town / village to base yourself around Briancon, Embrun to Barcelonnette for week’s cycling for 4 guys. Preference is to ride in out each day or drive then ride a loop back to car and drive back. 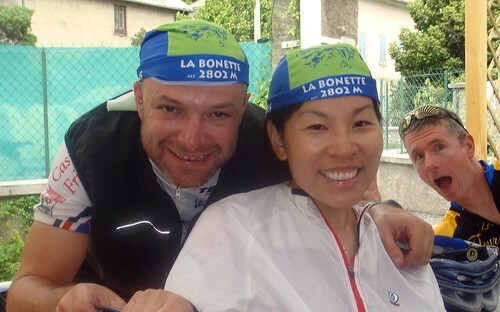 I have stayed in Barcelonnette twice. Very nice town – big, friendly main square with restaurants. 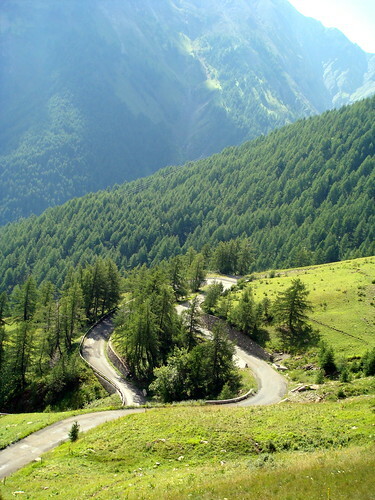 And it’s at the very base of so many great climbs. The road signs all point to famous climbs. Can’t recommend it enough. Briancon is OK, but bigger, uglier, busier. Maybe brief stay near Briancon (Serre Chevalier is nearby and at the base of the amazing climb to Col du Granon). 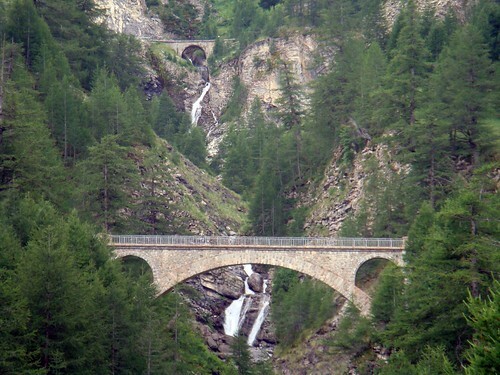 And then a longer stay in Barcelonnette.